Only five non-immunocompromised male patients completed the follow up and their data were used for analysis. The mean age was 41.2 ± 11.3 years (median: 35; range 31–54 years). All of them were positive for IgG antibodies but with different profiles for IgM and IgA, as well as PCR. For all patients the OCT exam showed active lesions with the inner retinal layers being abnormally hyper-reflective with full-thickness disorganization of the retinal reflective layers, which assumed a blurred reflective appearance and the retina was thickened. Toxoplasmic retinochoroiditis is a major cause of posterior uveitis [1–3], it was considered the disease of the year in 2011  and included in the list of neglected diseases by the Centers for Disease Control (CDC) of the United States . Toxoplasma gondii infection, the cause of this disease, may also occur during pregnancy during childhood or in adulthood. The clinical symptoms may appear soon after infection or delay with varying degrees of ocular involvement [6, 7]. T. gondii form latent cysts directly on the retina, which may be reactivated several years after the primary infection giving rise to retinochoroiditis. Although many episodes of retinochoroiditis are asymptomatic, some result in loss of vision, pain, photophobia, either in isolation or together . For a long time, toxoplasmic retinochoroiditis has been considered the most common eye lesion caused by T. gondii infection [9, 10]. Its prevalence appears to be quite variable in different countries, but estimates suggest that from 0.3 to 1 % of Europeans and North Americans develop this disease within 1–2 years of contracting the infection [9, 11, 12]. It is believed that the risk of developing this disease ranges from 18 in 100,000 individuals in the UK to as many as 382 in 100,000 individuals in West Africa [8, 13]. Furthermore, the risk of developing retinochoroiditis among individuals who contracted congenital infection is as high as 20 % before the age of 6 years and that new eye lesions may first appear in adolescence [3, 12, 14–16]. Studies in Brazil have shown that the prevalence of toxoplasma retinochoroiditis is variable but very high in adolescents and adults in some regions of the country; the disease ranges from 2 % in the southeast to 25 % in the southern region [10, 17–20]. A study in the State of Rio Grande do Sul revealed a prevalence of ocular toxoplasmosis of 21.3 % in over 13-year-old individuals and concluded that the disease is a consequence of postnatal infection . In the State of Pernambuco, it was observed that 56.2 % of cases of posterior uveitis were due to T. gondii infection  and in the State of Rio Grande do Norte, 56.9 % of the patients analyzed in one investigation had bilateral lesions . These studies make it clear that toxoplasmic retinochoroiditis is common in Brazil and thus an analysis of host risk associated with factors of this disease is justified. Furthermore, our recent study showed that the prevalence of toxoplasma retinochoroiditis is approximately 27 % among patients with eye diseases . The growing interest in the investigation of toxoplasmosis has helped to develop strategies for early laboratory diagnosis and clinical intervention [24–30]. Moreover, it has been found that imaging tests such as fundus photography, fluorescein angiography and optical coherence tomography (OCT) help in the assessment, registration and documentation of eye disease, thereby showing whether it is in the acute phase or quiescent, and can also be used to monitor eye involvement in respect to T. gondii infection [3, 31–39]. OCT is a noninvasive test that provides data to evaluate morphological changes that occur in the retina, vitreous, and choroid during ocular toxoplasmosis and other ocular diseases. The objective of this study was to monitor the evolution of active ocular disease or acute relapse of ocular toxoplasmosis using serology and molecular tests and evaluate their applicability. This study was approved by the Ethics Committee of the Medicine School in São José do Rio Preto—FAMERP and the selected patients signed informed consent forms after being informed about the nature of the study including the objectives and laboratory procedures that would be performed. In the period between August 2013 and July 2014, patients with clinical suspicion of active lesions or acute relapse of T. gondii infection were evaluated. Of a total of 31 patients enrolled and treated, five were selected because they adhered to the treatment regimen and were followed up for a period of 45 days (day 0; day +15;day +45). The and the start of the treatment were performed at day 0. New blood samples were collected for analysis at day +15 and day +45. The five patients received clinical care and were submitted to all the proposed tests (serological diagnosis of toxoplasmosis, cPCR to detect T. gondii in peripheral blood; OCT and fundus photography) at each return consultation. The inclusion criteria were patients with seropositive samples for toxoplasmosis, scarring of the retina characteristic of toxoplasmosis, and active retinochoroiditis lesion (satellite). Under 18-year-old patients were excluded as were immunosuppressed patients, patients receiving immunosuppression drugs and those with retinochoroiditis with clinical characteristics of other causes. Blood samples were collected in tubes with and without EDTA in all consultations. An investigation of T. gondii infection (IgM, IgG and IgA) was made and DNA was extracted from leukocytes. All patients underwent detailed eye examinations including visual acuity [the logMAR Early Treatment Diabetic Retinopathy Study (ETDRS) chart] with best correction according to standardization recommended by ETDRS , measurement of intraocular pressure by Goldmann applanation tonometry, biomicroscopy using a slit lamp, and stereoscopic biomicroscopy performed using a 78 diopters lens (Volk) and classified according to the criteria determined by the ETDRS. The OCT was performed using the RTVue-100 scanner with an axial image resolution and speed of five axial velocity of 26,000 frames per second using a program to measure the retinal thickness with the cursor placed according to the fixation of the patient or manually in the center of the fovea, when the foveal depression was visible. The analysis strategy utilized the macular thickness map measured in the central region of the retina. The evaluation was performed using radial cuts (horizontal and vertical of the line and cross line program) within the fundus area encompassing the toxoplasmosis ocular lesion. Whenever possible, three-dimensional OCT was conducted covering the entire retinochoroiditis lesion. In addition, standardized image acquisition programs such as MM5 (5 × 5 mm2 horizontal grid 11 by 11 vertical lines with 668 A-scans each and a 3 × 3 mm2 grid of six internal vertical and horizontal lines with 400 A-scans each), MM6 (12 radial lines with 1024 A-scans each within 6 mm in diameter) and macula 3D (128 scan lines with 512 A-scans each within 6 × 6 mm2) protocols were used, with all checks with signal strength of at least 40 (range 40.4–79.4). Colored fundus photographs and fluorescent photographs were taken using a digital retinal camera (TRC-50DX, Topcon Medical Systems) in order to document the macula region and optic nerve. Areas of progressive hyperfluorescence (leakage), impregnation of contrast (staining) and transmitted hyperfluorescence (window effect) were observed by fluorescein angiography. The progressive hyperfluorescence with delayed leakage of contrast was considered a sign of lesion activity. After evaluating the patient at baseline and collecting blood samples, ocular toxoplasmosis was treated using the following protocol: sulfadiazine 1 g four times per day, pyrimethamine 50 mg daily, folinic acid 7.5 mg daily and prednisone 0.5 mg/kg/day for 4 weeks. IgM, IgG and IgA anti-T. gondii antibodies were investigated using the ELISA test with the ETI—TOXOK-M (IgM), ETI—TOXOK-G (IgG) and ETI—TOXOK-A (IgA) commercial kits (DiaSorin, Italy); the results were confirmed by enzyme-linked fluorescence immunoassay (ELFA) Vidas Toxo IgG and Vidas Toxo IgM (bioMérieux, France) according to manufacturer’s directions. Genomic DNA was extracted from 5 mL of peripheral blood samples collected in EDTA as previously described  using the commercial QIAamp® DNA Blood Mini Kit (QIAGEN, The Netherlands) . Toxoplasma gondii was identified in blood samples using a previously described technique  that amplifies a final volume of 25 uL per reaction tube using the reagent GoTaq Hot Start Green Master Mix (Promega, USA). Each reaction tube (mix) contained 25 pmol of each primer, 1 U of Taq DNA polymerase, 10 mM Tris–HCl at pH 8.5, 50 mM KCl, 1.5 mM MgCl2, and 200 mM of each dNTP. Two negative controls (ultrapure water and genomic DNA negative for T. gondii) and a positive control (DNA extracted from the RH strain of T. gondii) were included in each amplification reaction. The B22 and B23 primers, which amplify a 115-base pair (bp) fragment of the repeat region of the B1 gene, were utilized . The HGH primers that amplify a 400-bp fragment of the human growth hormone gene were used as a control of amplification and detection of PCR inhibitors. The amplicons were analyzed by electrophoresis in 2 % agarose gel, stained with ethidium bromide and viewed under ultraviolet light. Data were analyzed descriptively to determine the importance of OCT to monitor the progression of active ocular disease or acute relapse due to infection by T. gondii. From the 31 patients enrolled in this study, only five completed the proposed follow up; all of them were male. The mean age was 41.2 ± 11.3 years (range 31–54; median: 35). At the time of inclusion, all of them had positive serology for toxoplasmosis IgG antibodies. Table 1 presents the data from serological tests for IgM, IgA and IgG anti-T. gondii antibodies of the five patients enrolled in this study and Table 2 shows the cPCR results. Figure 1 illustrates the results of color retinography imaging (a) fluorescein angiography (b) and OCT (c). Table 3 shows the pattern of eye involvement of the patients with suspicion of acute ocular toxoplasmosis by color retinography imaging, fluorescein angiography, and OCT.
Additional informations are described in Additional file 1. The aim of this study was to evaluate the use of serological, molecular and imaging methods to monitor the status and symptoms of patients clinically diagnosed with acute ocular toxoplasmosis. The B1 gene of T. gondii was used as target for molecular analysis since it has been described as more appropriated to characterize clinical samples in Brazil in contrast with observations from other countries [24, 28, 30, 43–51]. The mean age of the five patients enrolled in this study was about 45-years- old, supporting reports that ocular toxoplasmosis affects young individuals [3, 52, 53]. It is possible that the disease is a result of congenitally acquired infection as the results do not allow us to verify the manner in which the toxoplasmosis was acquired. The ELISA assay showed that one of the patients (case-01) had acute infection due to the presence of IgM and IgA antibodies at the time of enrollment. This condition remained throughout the follow up which suggests that serological evidence of acute infection may continue even after treatment. This observation is in agreement with literature reports indicating that IgM antibodies persist in patients under treatment for ocular toxoplasmosis. It is also possible that this patient is a special case of individuals who have persistent IgM antibodies (IgM residual); this situation creates additional difficulties in laboratory diagnosis and in the continuation of treatment for long periods of time as it may lead to the impression that an infection is acute or a reactivation of infection [54–60]. By ELISA, one patient (case-02) was positive for IgM antibodies on day 0 but did not have evidence of IgA antibodies in subsequent analyzes. Given that he was positive for IgG antibodies at enrollment in the study, it appears that he seroconverted to a chronic infection. However, these data are not enough to predict the time that the infection occurred. This condition seems to be common in patients infected with T. gondii irrespective of clinical evidence of ocular disease [25, 54, 56, 61, 62]. The other patients were not positive for IgM and IgA antibodies at inclusion in the study but the identification of IgG antibodies was used to infer a chronic infection. Except for one patient (case-01), all responded adequately to the treatment regimen and the imaging tests showed a reduction of ocular inflammation during the follow-up period. This patient shows a different profile since he presented serological evidence of acute infection but the cPCR was negative during the follow up. Maybe this is a case of atypical strain infection not detected by B1 gene as previously described and the cPCR should be done using other set of primer as being reported in other regions of the world [3, 26, 44, 47, 63–67], but not in South American studies [30, 45, 48–50, 68–72]. There were no variations in the serological profile of three patients (case-03–05) but the cPCR results were positive at day 0 (cases 04 and 05), day 15 (case-03) and day 45 (case-05). These conditions of infection revealed by cPCR in the peripheral blood may be the result of two possible situations: the presence of residual DNA or a false-positive result [25, 43, 48, 56]. These data are in agreement with that reported by Novais et al. 2014  which found positive PCR in Brazilian patients presenting inactive toxoplasmic retinochoroidits lesions and with our previous report . Additionally our study observed that one patient (case-05) had clinical evidence of reactivation of ocular disease based on the PCR results. Fluorescein angiography showed progressive hyperfluorescence with delayed leakage of contrast and OCT showed that the locations of the lesions of all patients had abnormal inner layers of the retina with hyper-reflective thickened and blurred areas. The level of resolution of this imaging method is well suited to show the characterization of ocular lesions, including those resulting from T. gondii infection [36, 39, 73]. The presence of specific antibodies against T. gondii (IgM and IgA) identifies acute infection and confirms the clinical evaluation. Furthermore, our data suggest that the treatment used in this study may modify the serological profile of IgM antibodies and the result of cPCR, but not the serological profile of IgG and IgA antibodies. Exceptions to this observation can be seem among patients with tendency to remain with residual IgM specific antibodies [25, 49, 56, 58, 59, 74, 75]. The present investigation was limited by the small number of patients evaluated and included. Would be desirable studies with a large amount of patients around the world and in Brazil which could confirm the results reported here. In conclusion, blood tests are useful to monitor ocular toxoplasmosis and to determine whether the infection is acute or chronic. Molecular analysis by PCR helps to identify possible parasitemia and monitor the effectiveness of treatment as therapy together with the immune response should eliminate parasites circulating in the peripheral blood. Finally, this study shows that imaging tests are excellent noninvasive tools of photo documentation and to monitor inflammation and subsequent scarring of areas damaged by the parasite during ocular toxoplasmosis. CCBM corresponding author, head of the FAMERP Toxoplasma Research Group, was responsible to concept and design of the study. MP, FBF, RCS, APB, PPMN performed the inclusion of patients with ocular toxoplasmosis, sample collection, and develop the ophthalmological clinical evaluation and clinical analyses. FHAM, AFS, CSM, RG performed the laboratorial tests; VLPC head of the IAL Toxoplasma Research Group; CCBM, RCS, MP, LCM, VLPC performed the data analysis, interpreted the data and wrote the manuscript. All authors read and approved the final manuscript. CCBM declares that received grant to support the publications fees payment from São Paulo Research Foundation (FAPESP #2014/20512-9). This study was supported by research grants (FAPESP #2009/17540-2 to LCM; #2011/13939-8 to VLPC), and by scholarship grants to MP (FAPESP #2013/10050-5), and to FHAM (FAPESP# 2013/15879-8). The opinions, assumptions, and conclusions or recommendations expressed in this material are responsibility of the authors and do not necessarily reflect the views of FAPESP. This study was supported by the Brazilian Ministry of Science, Technology and Innovation—Conselho Nacional de Desenvolvimento Científico e Tecnológico (CNPq) to VLPC (#303489/2012-0) and to LCM (#473579/2009-0) and by BAP-FAMERP to LCM and to CCBM. 13104_2015_1650_MOESM1_ESM.docx Additional file 1. 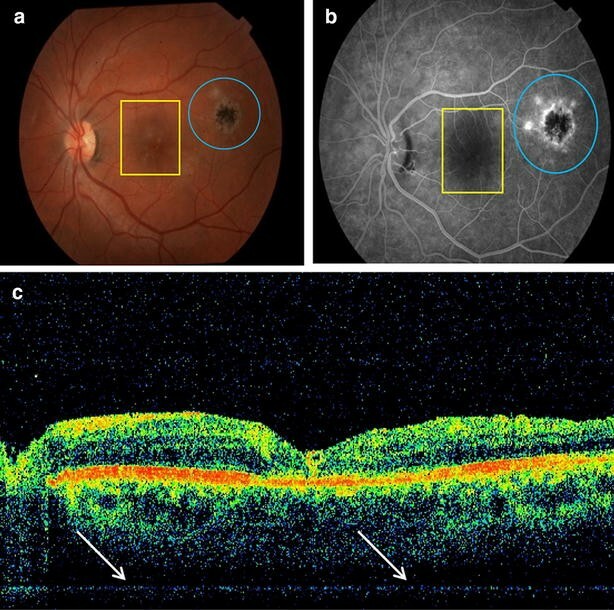 Clinical data and results of imaging studies (fundus photography, fluorescein angiography and Optical coherence tomography) of the five patients who correctly completed the follow-up. CDC - Toxoplasmosis. http://www.cdc.gov/parasites/toxoplasmosis/. Accessed 13 Dec 2014.